PATH, trail or path to the English, all in uppercase to indicate the pedestrian path of Toronto in Canada, the largest commercial center of the world. 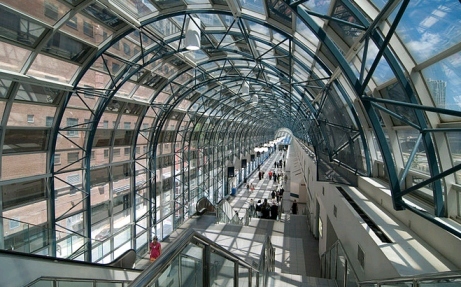 Although this overhead bridge of glass and steel, the SkyWalk, is part of Toronto’s PATH, even if it is underground. In fact connects two portions of the large pedestrian path, without having to go outside. But why is it so important to avoid going out in the open air? Average temperature in Toronto: -3.1 in December, -6.7 in January, -5.6 in February, -1.9 in March. Record temperatures in Toronto: -2.2 in September, -8.9 in October, -20.6 in November, -30 in December, -32.8 in January, -31.7 in February, -26.7 in March, -15 in April, -3.9 in May, -2.2 in June. That it is enough to explain why. PATH is a complex, a network, a network of pedestrian tunnels that stretches for over 18 miles beneath the office towers of downtown Toronto, along. According to Guinness World Records, PATH is the largest underground shopping complex in the world, with 371 600 square meters of space dedicated to retail. More than 50 buildings or towers for offices are connected via the PATH system. Among these twenty parking spaces, five subway stations, two department stores, two major shopping centers, six major hotels, and a railway terminal. The CN Tower and Rogers Centre are connected by an elevated walkway; the SkyWalk precisely. In the future they are planning, designing and building, as well as 45 new points of entry, new tunnel to get to 60 miles underground walkway, underground connections. It was also decided that any new construction in the city, should provide a link to the PATH. As if to say, an underground city in the service of the one that sticks out on the ground.